Kalimba Sansula - Ake Bono - New! The tuning in Heavenly A. 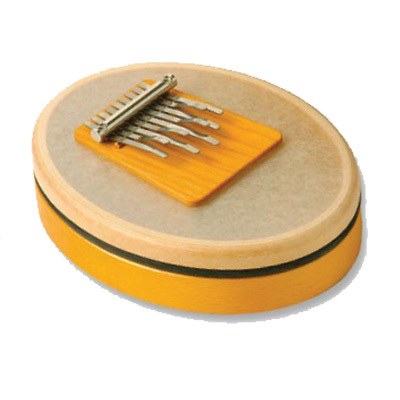 This Kalimba Sansula is a high quality German made instrument mounting a Mbira or thumb piano on a small drum. The Sansula is the Stradivarius of the kalimbas with the magical over-tones and can be set in your lap and the player can move it up and down to create a variety of over-tones and vibrations. The tuning in Heavenly A allows wonderful melodies to be produced almost of their own accord, simply by plucking the tines with the thumbs. As all the notes harmonise with each other, beginners also enjoy immediate success with their instrument. Size: 19cm x 15cm x 6.5cm. Now available in either A440 Hz or A432 Hz.